Water kefir is an easy to make, naturally fermented drink that is allergen friendly and loaded with probiotics, B vitamins, and food enzymes. 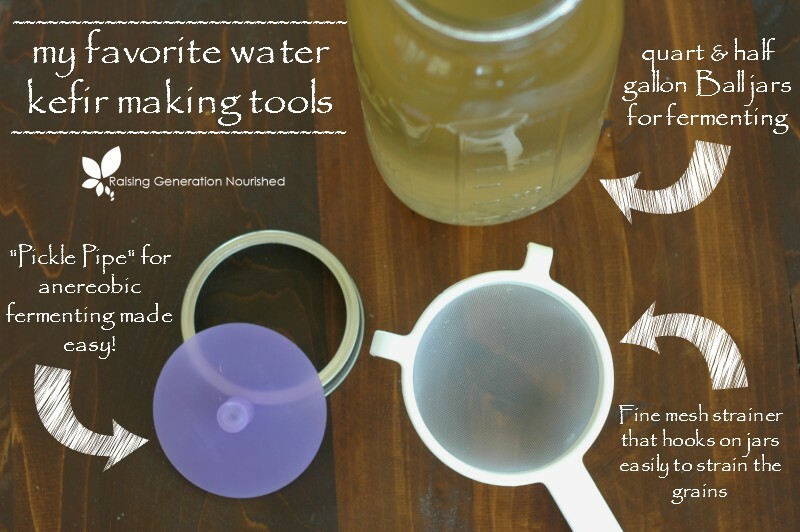 Water kefir is one of our favorite household ferments! 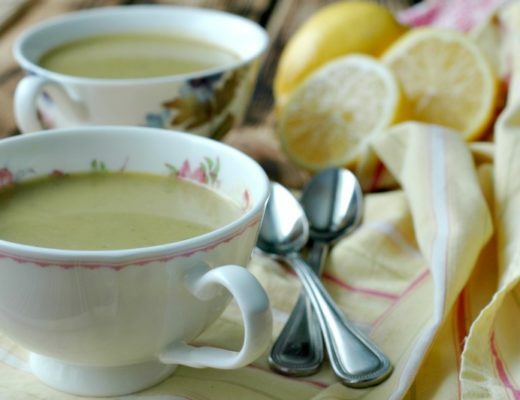 This mild, lemony, kid friendly drink is not quite as strong as other popular fermented tonics like beet kvass or kombucha so it tends to be a nice way for newbie real foodies to introduce probiotic-rich food into their home. How does water kefir work? 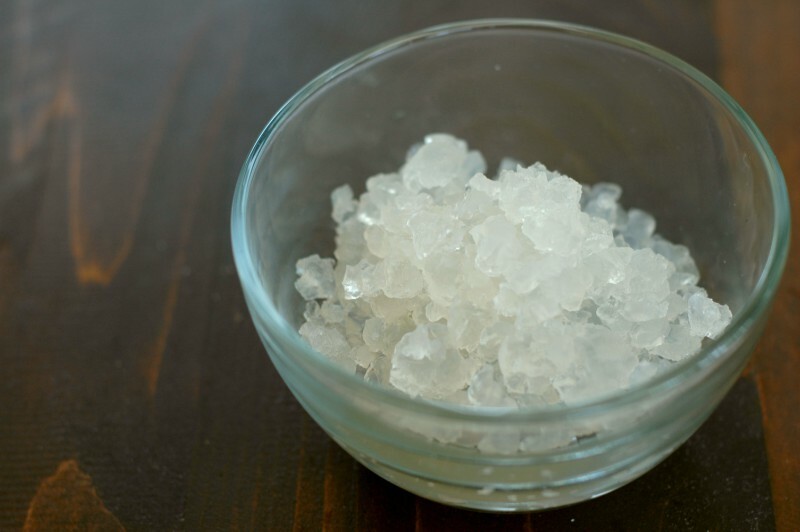 Water kefir grains are small, gelatin-like structures made up of various beneficial bacteria. These grains will thrive and even multiple indefinitely when kept properly, living in fresh mineral rich sugar water. The bacteria and yeasts in the water kefir grains feed off of the sugar and minerals in the water, infusing the water with loads of probiotics essential for gut health along with an array of B vitamins and enzymes. Ok super cool! What’s the commitment here?! Every 2-3 days your water kefir grains will need fresh sugar water since the bacteria eat it all up! It takes me 5 minutes of time to switch out the water every few days. It is a fantastic project or chore chart item for appropriately aged kids – my 2 older girls (aged 5 and 7) help me still – I would imagine slightly older children could do it themselves. It is a bit like having a “pet” and it is a fantastic, on-going science project to explore! I’m ready to get started! Where do I get my water kefir grains? If you hop on any “crunchy” Facebook group in your local area and ask for kefir grains, I have found many to be very willing to share! Especially in the warm summer months, those grains multiply like crazy when fed well, and people are more than willing to split theirs. I have been using Cultures for Health water kefir grains for years, and they have always been so plump and healthy – very easy to work with! The first step is to find a jar for your water kefir grains to live in. You’ll want a to use a quart or half gallon mason jar, and an air-lock lid or Pickle Pipe (I use a Pickle Pipe). A traditional style fermentation crock or even a Fido jar works well too. A fine mesh strainer for straining out the grains after brewing will be needed too. While you can get a decent ferment with a mason jar and regular lid or cheesecloth, after reading this article from my friend Jessica a number of years ago, and doing some research, it seems these type of ferments do best in an “anaerobic” (no oxygen) type environment. I was shocked at how bubbly my first ferments were after making the switch to using an anaerobic seal. The Pickle Pipe is so easy to use, and really easy (read: quick!) to clean. It automatically “burps” your ferment so the gasses don’t build up too much, and I love not having to think about that! Your Pickle Pipes can be used for fermenting other things like sauerkraut, kimchi, pickles, etc too. They are one of my favorite real foodie tools! Water kefir thrives best with mineral rich water and sugar. Since most of us do not have water that is rich with minerals, it is a good idea to supplement your water with a little sea salt and ConcenTrace . Both are teaming with minerals that will give your kefir grains what they need to grow and thrive. Heat the 1/2 cup of water stovetop and while that is warming put the sugar, sea salt, and ConcenTrace into a quart mason jar. 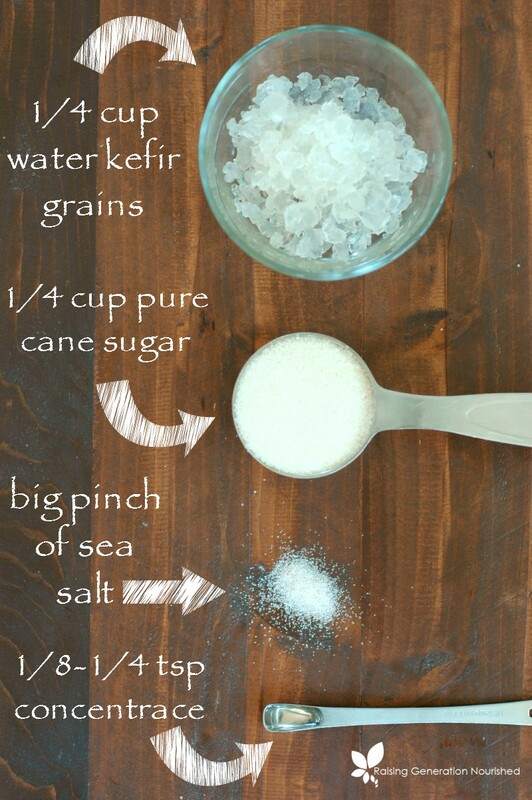 (If you have more than 1/4 cup of water kefir grains, simply double this recipe into a half gallon jar). Fill the jar the rest of the way with fresh water, leaving a couple inches of headspace at the top. This is your sugar water! Add your kefir grains to the sugar water and put your lid on. Let the water kefir ferment at room temperature for 2-3 days. This ferment prefers to be in the dark so I place mine in a kitchen cupboard. A closet works too. The warmer the air temp, the faster your ferment will go so keep the weather in mind especially in the summer. If you live somewhere cold, it may take longer. After your kefir has fermented to your taste, make another batch of sugar water, strain out the grains and place the grains into the fresh sugar water to ferment again. The fermented water kefir left behind can be consumed right away (I like it with a squeeze of lime or lemon! ), or chilled in the fridge to drink later. You can also do a "second ferment" on your finished water kefir to flavor it, creating a bubbly, "soda-like" drink. Doing a second ferment on your finished water kefir creates a bubbly, soda-like drink that you can flavor any way you like! Whatever fruit is in season makes for a fun, flavored drink that really feels like a soda pop. Your second ferment will become bubbly with a tight fitting lid – I prefer to use grolsch style (flip-top) bottles as I have gotten the best result with them. 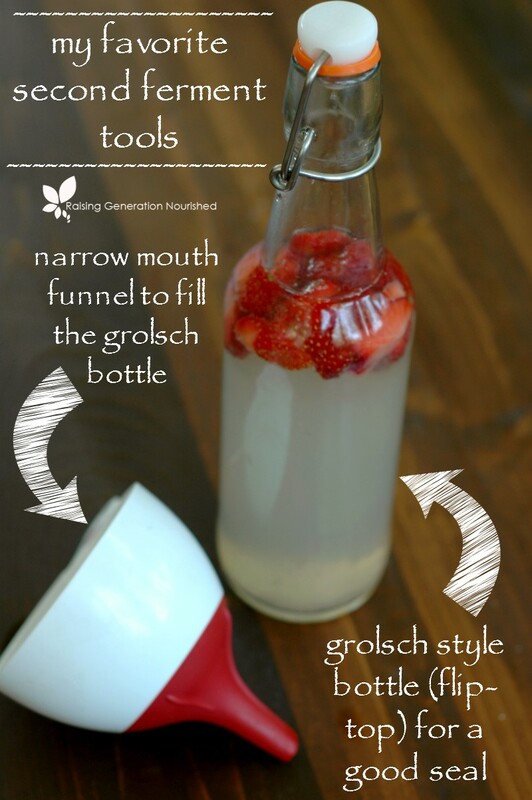 A narrow funnel is also a good tool to have on hand to pour the water kefir into the bottles. 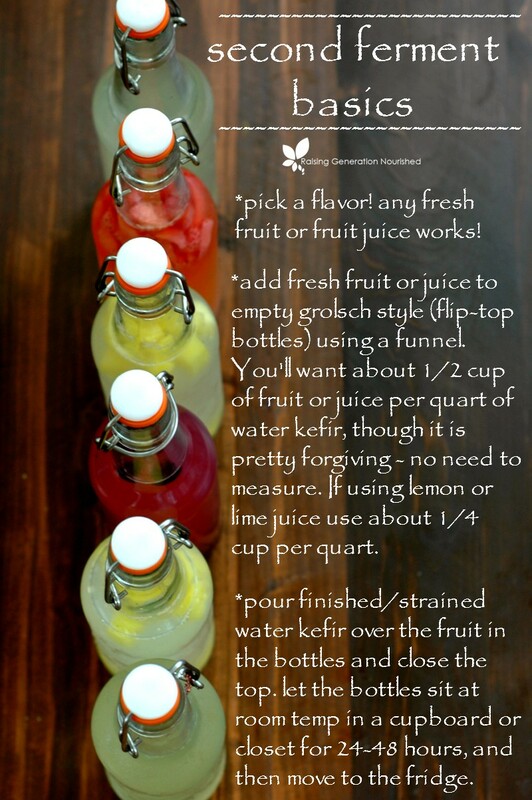 Put the chopped fruit or juice into your flip-top bottles and use a funnel to pour the brewed water kefir into the bottles. Close the lids. Place the bottles in a dark cupboard or closet for 1-2 days. You may want to “burp” your bottles once a day to let some of the air out or your ferment will overflow upon opening! I tend to forget this part and just open my bottles slowly because they do get very, very bubbly! After 1-2 days of fermenting, move your bottles to the fridge to chill. Water kefir is really considered more of a health tonic. While it makes for a really fun drink especially for kids to drink, making it a soda replacement isn’t advised. Starting out with 2-3 ounces for kids, and 4-6 ounces for adults is a good starting point. I tend to start toddlers/kids out with a couple ounces watered down a bit. Some to be sure they stomach the new bacteria ok, and some to tame the sweetness for young palates. Adults and big kids ought also heed starting out small to introduce the new bacteria to the gut. Once you know your body is tolerating the new bacteria well, enjoy a cup or so everyday – your gut will thank you! Since the bacteria in the grains consume the sugar in the sugar water, the sugar content is actually quite low. Undoubtedly there will be questions about whether raw honey, coconut sugar, or other sweetener might work for the sugar and it really just doesn’t work. The beneficial bacteria feed best off cane sugar. As with all fermented drinks, there is a small amount of alcohol produced when brewing water kefir. I have read anywhere from 0.5% to 0.75%. The longer the kefir is brewed, the higher the alcohol content. 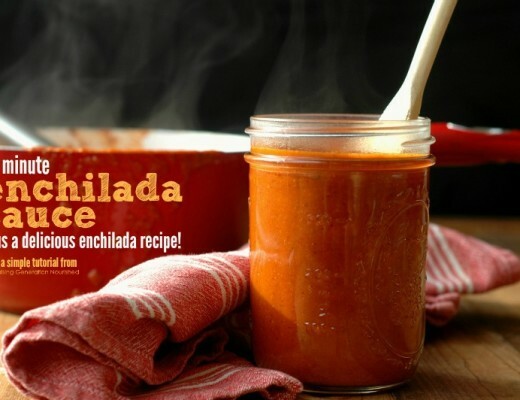 10 Minute Enchilada Sauce :: Plus a delicious enchilada recipe! What fantastic information, Renee! I’ve been planning to explore kefir, and this looks like a great project to start with. The one thing that made me pause when I first looked into water kefir was the sugar. Do the bacteria really consume most or all of it so I’m not giving my kids sugar? Thanks for a great post — sharing! Hi Susannah! Yes they really do – take a taste of the water before and after the ferment and you will notice! Great tutorial Renee! I make continuous kombucha and wanted to try something different for a change. This tutorial is really helpful! Thank You! I think you will enjoy it Dr. Karen! Keep me posted! 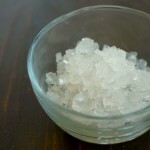 What about crystallized fructose in stead of sugar? My daughter has a sucrose intolerance so can’t have any sugar. Hi Amanda! I have never tried it so I’m not sure – I do know that everything I have ready has said that natural sugars such as honey, maple syrup, molasses, etc do not do the trick for the ferment as well as pure cane sugar so I’m not sure if that helps. I have never heard of crystallized fructose (I would imagine some how they take some fruit sugar and crystallize it?). I did extensive research and will be following the recipe as written because the process breaks the sucrose down and the remaining sweet taste is fructose. Learn something new everyday, thanks for your help. I have pikle-it jar i usec for making saurkraut. Is it OK to wash it well and use it for water kefir? Also, the rubber airlock that keeps it shut seems to keep some smell from the kraut no matter how I wash it. Hi Chaim! First of all yes the Pickle-It should work! I’m not sure on the cleaning part – maybe try soaking the rubber part in lemon juice and baking soda – that always seems to help with smells for my stuff! Or vinegar and baking soda. I hope that helps! Hi renee! I bought the Cultures for Health water kefir grains to get started. The pack only contained about 2 teaspoons of grains but I noticed your recipe calls for 1/4 cup. The recipe on the box for getting these started is the exact same as yours. Just curious as to why you use so much more grains in your recipe. Thanks! Hi Amanda! You have to hydrate the grains in the packet first according to the directions on your box – you will have a good 1/4 cup once they are hydrated and then they will be ready to use! I observed that my grainsr are not fementing and bubbling as they used to, do they get tired afterr long use am I doing something wrong?. Hi Teresa! You can feed them some extra minerals as water kefir grains thrive on that. Extra blackstrap molasses, Concentrace, sea salt to name a few are some ways to boost the mineral content so the bugs have some life breathed into them! I work at a sugar factory. Our sugar is made from sugar beets, which is quite common in households. Any reason this wouldn’t work? That should be fine Sherry! If I have extra grains, how should I store them? I have 1 cup right now but making a gallon of kefir every two days seems like too much. Thanks! Is it safe to order the kefir grains off of amazon? Would it be better to source them locally if I can? Thank you for your information! I hope more people begin to learn about how great kefir is. Hi Billy! I do purchase mine from Cultures for Health on Amazon and haven’t had issues. If you have a local friend with some kefir grains that have multiplied and can be split, that works too! Great information! I’ve found over time that I have some difficulty keeping the alcohol content down in the second ferment. My batches were coming out delicious, but had the kick of a beer! So if you’re looking for a tasty probiotic alcoholic drink, that’s good. But I was trying to have a health drink and go back to work haha! In the end, I found that citrus fruits and herbs/spices create the flavor without as much alcohol. These days I do almost all lemon, grapefruit, mint, or ginger/lemon batches and it’s a lot less alcohol. Sometimes less fizz too unfortunately, but I just let it ferment an extra day. I have a batch of crystals and am on my 3rd batch. Do the crystals need to stay in a strainer bag in the liquid or can they just be put in the bottle loose? Mine came with a cloth bag. Thank you, love your article! Hi Liz! Yes, you can leave them loose in the water kefir – I strain mine out using a mesh strainer. You just want to be sure whatever you are straining in is not metal/stainless steel as it can disrupt the bacteria. I have the plastic strainer linked in the post. I hope that helps! Hello! First, I would like to thank you for all of the wonderful information you have provided! I am brand new to water kefir and you answered so many of my questions, thank you. Ok, so I started my kefir today and now that I have read this article I am realizing that I made a huge error, I used organic coconut sugar. I’m wondering if when I get home from work tonight, can I drain all of the liquid, rinse off the grains and start over without causing too much damage? The grains came to me dehydrated so I am worried that I’m going to stop any type of rehydration process by doing what I suggested. Any help you can provide would be amazing! Thanks again! Hi Ginella! Yes, I think that would be just fine to strain and feed the sugar water! Can you use the pickle pipe on the second ferment and still get fizz? I had an explosion the first time I tried a second ferment (even though I burped it on the first day) so I’m kind of scared to use a completely air tight bottle again. About to make my first batch of Kefir. I bought water Kefir granules pack but just wondering if I can use these to make coconut Kefir? Hi Kerryn! 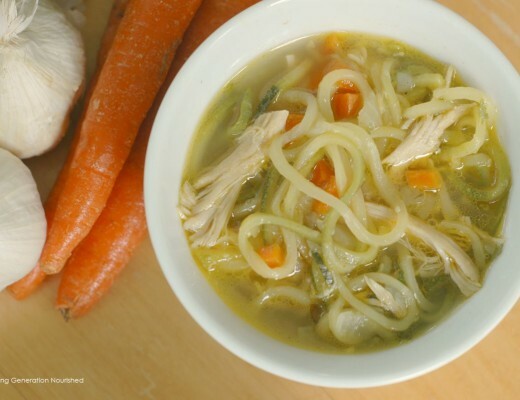 Yes you should be able to – there is instructions on the Cultures for Health website!